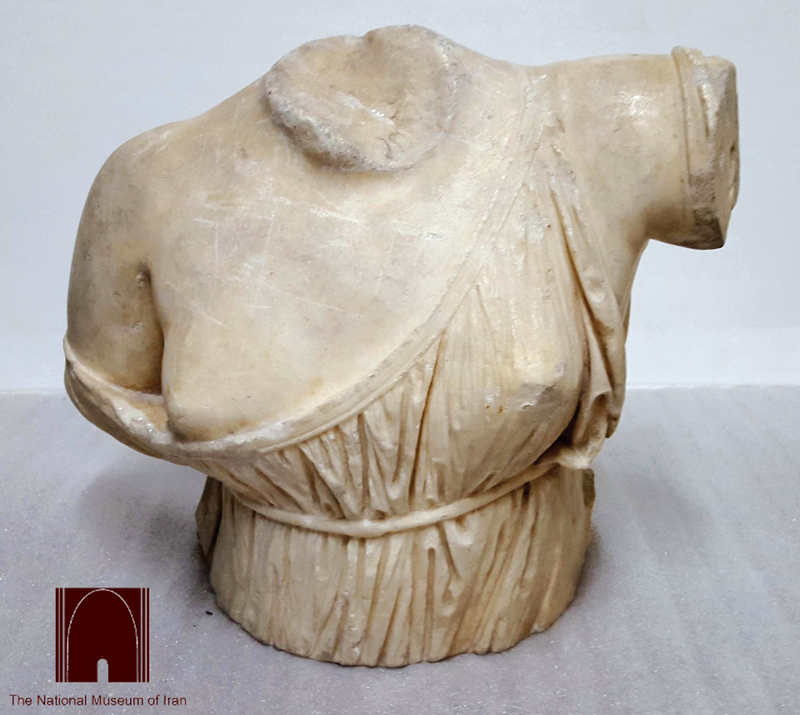 Headless upper female torso of white (eastern Mediterranean?) marble. Said to come from the Iḏeh (form. Malāmir) region (Baḵtīārī mountains), Ḵūzestān province, Iran. Second or first century BC. National Museum of Iran, no. 2592. H. 0.328 m, W. 0.36 m, Th. 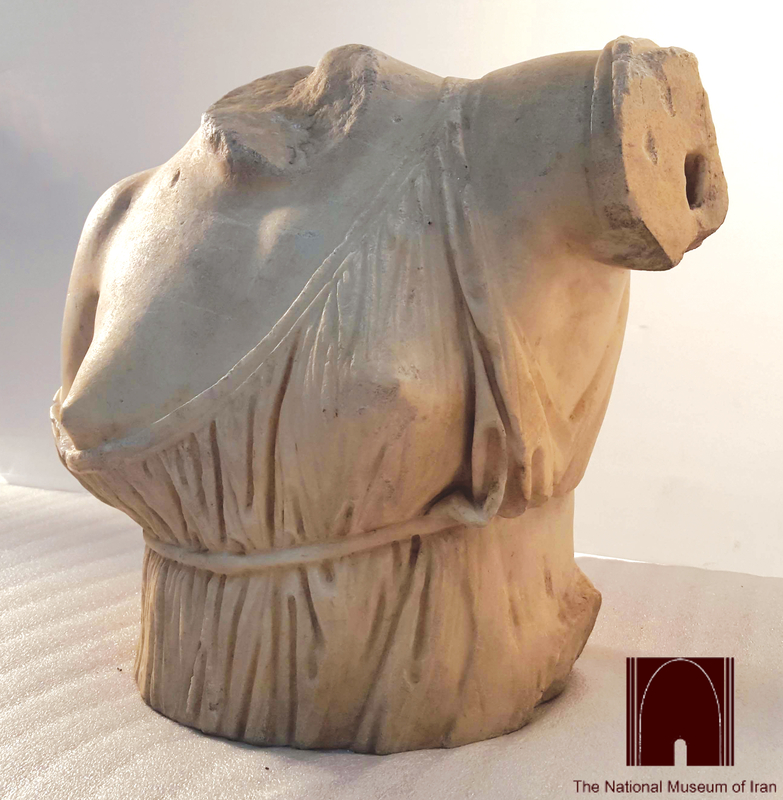 0.225 m.
The find, a marble female torso draped in an Ionic chiton which is slipped off the right shoulder, comes from an unknown cultural and archaeological context (hellenistic? Parthian?, e.g., Schlumberger 1983: 1037 and Callieri 2007: 76-77, respectively). It was first illustrated by Roman Ghirshman (1962: 22 and fig. 28). 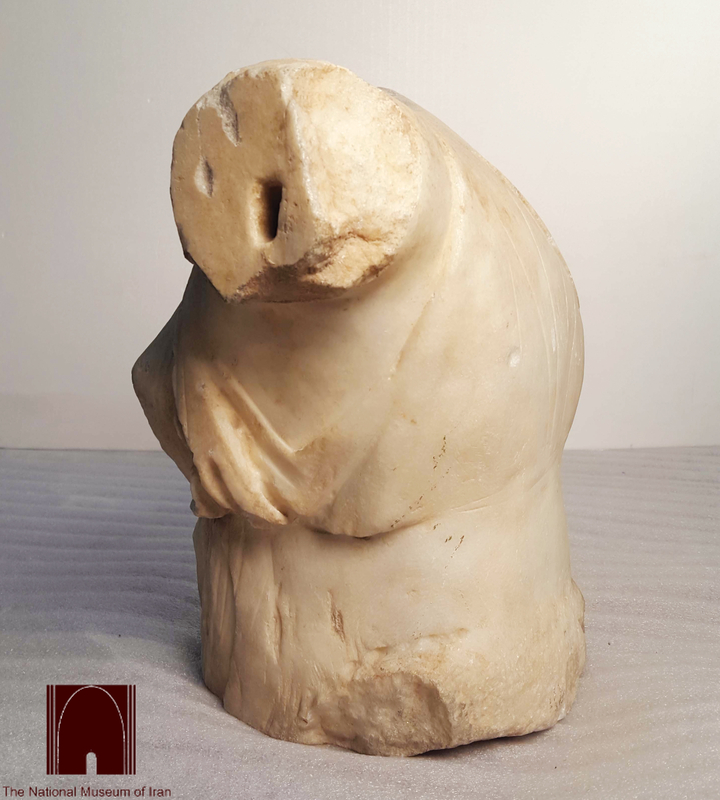 In technical terms, the sculpture is deemed 'an example of pure hellenistic Greek craftsmanship' datable to the second or the first century BC (Colledge 1979: 224; idem 1987: 152). Dowel holes for attachments on the lower side of the torso and on the cut on the left arm point to a sculpture assembled from separate parts, not all of them necessarily executed in the same material. This would be in keeping with a practice that is widely attested in the Greek world (Colledge 1979: 224) and is also encountered in the instance of the famous Aphrodite Anadyomenē of Nisa (Invernizzi 2008: 3-42). According to Pierfrancesco Callieri (2001: 111, no. 134; 2003; 2007: 72-77, figs. 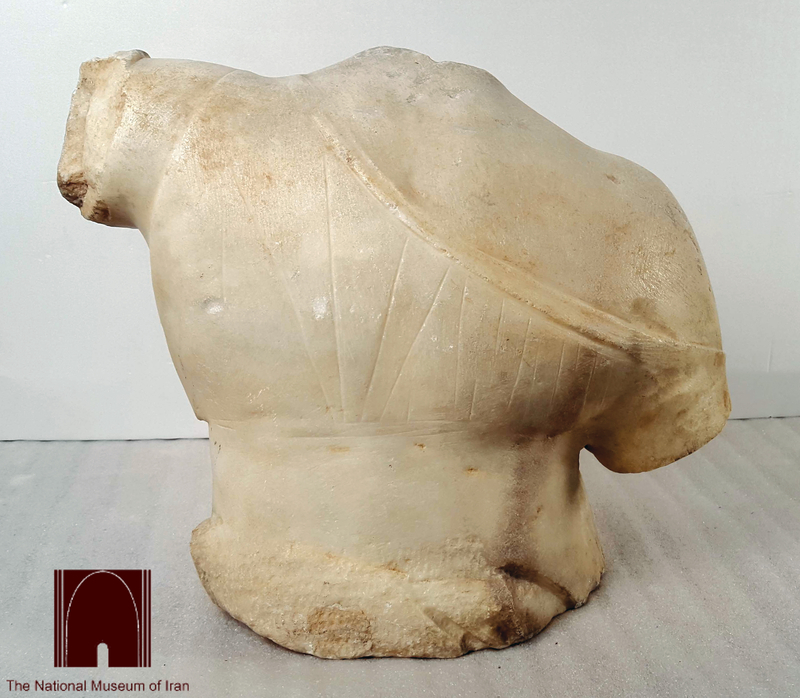 40 and 41), the partially incomplete treatment of the back of the statue, which contrasts with the careful finish of the front, could imply that the piece was placed against a wall or within a niche, as with cult images in both the Greek and the Mesopotamian world. Such a placement would undermine, as he notes, earlier comparisons of the torso with the hellenistic type of Aphrodite Callipygous (e.g., Lauter 1971: 601, followed by Fleischer 2003: 228-229 no. 134), in the case of which exposure of the back of the statue would be indispensable. The possibility has been raised tentatively that the now missing head of the statue might be none other than a marble female (?) head obtained at Šamī, the site of an ancient mountain sanctuary in the region of Iḏeh, in 1935 (Callieri 2007: 76-77 and n. 43). Callieri, P. 2001. ‘L’Iran nel periodo macedone e seleucide.’ In Antica Persia. I tesori del Museo Nazionale di Tehran e la ricerca italiana in Iran. Rome: 101-111. ——. 2003. ‘'Su una piccola statua in marmo dall'Elimaide (Iran).’ In Acquaro, E. and Callieri, P. (eds. ), Transmarinae Imagines. Studi sulla trasmissione di iconografie tra Mediterraneo ed Asia in età classica ed ellenistica. Sarzana: 149-164. ——. 2007. L’archéologie du Fārs à l’époque hellénistique. Quatre leçons au Collège de France, 8, 15, 22 et 29 mars 2007. Persika 11. Paris. Colledge, M. A. R. 1979. ‘Sculptors’ stone-carving techniques in Seleucid and Parthian Iran, and their place in the “Parthian” cultural milieu: some preliminary observations.’ East and West 29: 221-240. ——. 1987. ‘Greek and non-Greek interaction in the art and architecture of the Hellenistic East.’ In Kuhrt, A. and Sherwin-White, S. (eds. ), The Interaction of Greek and Non-Greek Civilizations from Syria to Central Asia after Alexander. Berkeley and Los Angeles: 134-162. Cumont, F. 1926. Fouilles de Doura-Europos (1922-1923). Paris. Fleischer, R. 2003. ‘L’art grec en Iran avant l’époque parthe.’ In Seipel, W. (ed. ), 7000 ans d’art perse. Chefs-d’œuvre du Musée National de Téhéran. Milano and Vienna: 221-229. Invernizzi, A. 2008. Nisa partica. Le sculture ellenistiche. Monografie di Mesopotamia XI. Florence. Lauter, H. 1971. ‘Compte rendu de W. Fuchs, Die Skulptur der Griechen, München 1969.’ Gnomon 43: 597-603.